This newly manufactured self-defense ammunition features boxer-primed brass casings (reloadable), non-corrosive propellant, and jacketed hollow-point bullets. The hollow-point loads are ideal for self-defense as they provide for maximum energy transfer upon impact but controlled expansion during penetration. Wolf Ammunition is one of the largest ammunition manufacturing companies in the world with an established brand recognized in both the United States and abroad. We all know how hard 380 ammo is to find. 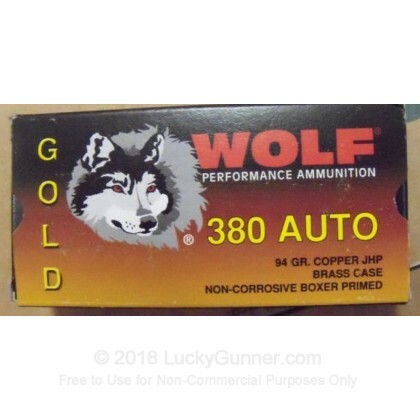 I tell everone I see to get your ammo at luckygunner. I recommend them to all. Great Ammo, great price, and quick shipping. I'm satisfied. Very good service and quality product. Highly recommended. Bought for personal protection/concealed carry. I shot two clips at the range. Excellent performance. I'd recommend.